Nigerian journalist Ameto Akpe, who recently spoke as part of the Wilson Center’s “Nigeria Beyond the Headlines” event, has published a new article on water scarcity in Abuja, Nigeria’s capital city, for the Pulitzer Center on Crisis Reporting’s “Waiting for Water” series. Jibril Ibrahim, the Director of the FCT water board, the agency solely responsible for the production and supply of water in the territory, admits that the authorities did not see this coming. He says this unexpected population growth has overwhelmed existing water infrastructure and ruined the careful plans for water service delivery in the territory. Patience Achakpa, executive secretary for the Women’s Environment Programme, believes that the government should have foreseen the potential attraction a city like Abuja presents to the urban migrant and should have put in place more efficient plans. This lack of foresight means there is no pipe reticulation in many districts, particularly in peripheral areas. Even government housing projects are routinely built without being connected to the grid, simply lacking the crucial distribution network that would bring water to individual homes. Thus each household is forced to sink its own borehole, which in the long run has obvious implications on ground water. Read the full article on the Pulitzer Center website. 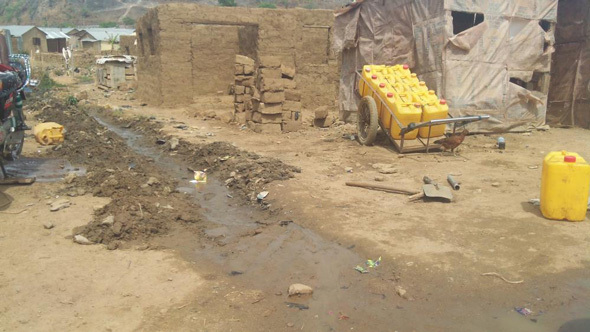 Photo Credit: A water point in Gishiri, Abuja, courtesy of Ameto Akpe/Pulitzer Center.